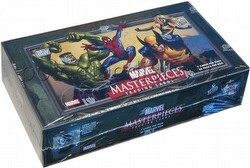 One Original Art Sketch card is found in every Marvel Masterpieces box! Other insert cards include a 9-card X-Men set, a 9-card Parallel Foil X-Men set, a 9-card Spiderman set, a 9-card Parallell Foil Spiderman set, and an 18-card Splash Page set. The base set includes 90 cards. There is also a 90-card Parallel Foil base set.